It’s Saturday night at the Rehabilitation Centre for Children— clinics are closed and offices are completely still. But one corner of the building is buzzing, and the excitement can be heard ringing throughout the hallways. 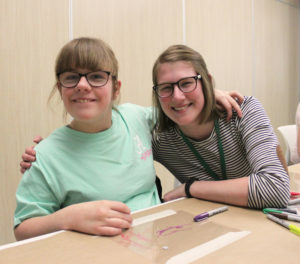 Ellie Boggs (left) and Recreation Therapist, Maya Kirstein, at the Rehabilitation Centre for Children’s Saturday Night for Teens program. Your generosity made it possible for 60 youth to attend the program this year. 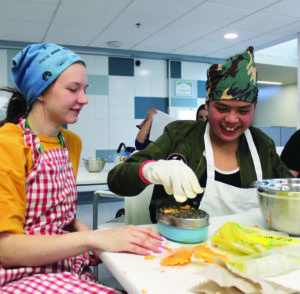 “It gets loud sometimes, but that’s okay,” says 13-year-old Ellie Boggs about Saturday Night for Teens, a program run at the Rehabilitation Centre for Children.A group of about a dozen teens are busy prepping ingredients to make homemade pizzas, while another handful sit around a nearby table crafting colourful key chains. The program is best described as a fun hang-out with friends. A group of about 15 youth meet every month at the centre where they cook dinner, play cards, do crafts, and a whole variety of other activities. “Out of 500 students at Ellie’s middle school, she is only one of two kids who use a wheelchair,” explains Ellie’s mom, Chrystie Kroeker Boggs. Saturday Night for Teens is part of the Rehabilitation Centre for Children’s LIFE (Leisure in Fun Environments) program, which is entirely funded by the Children’s Rehabilitation Foundation. The LIFE program provides a wide-range of activities, from cooking clubs to music therapy classes, everything is focused on inclusion and ability. Staff member, Raija (left), and participant, Jhaz, prepare Pizza at Saturday Night for Teens, a program entirely funded by your support of the Children’s Rehabilitation Foundation. “Many of the youth who attend Saturday Night for Teens are not able to go out on their own or make plans with their friends. We are able to provide a parent-free zone, where teens can be teens and hang out in a fun and supportive environment.”“For parents raising children with special needs, these opportunities can be hard to find,” says Carol Kehler, a physiotherapist with the Rehabilitation Centre for Children. Your donations made it possible for 60 teenagers to attend Saturday Night for Teens and make meaningful friendships this past year. “I have lots of friends here. It’s a lot of fun,” Ellie says. And if the noise ringing through the hallway is any indication, there’s lots of that happening here. Saturday Night for Teens is made possible through your support! Donate today!